Origin and Habitat: This species is endemic to Argentina, where it occurs near Suyuque Nuevo and Suyuque Viejo, and in the adjiacent areas on the southwest flank of the Sierra San Luis. The species is known from only one population, and it is sparsely distributed (extent of occurrence less than 100 km2). Altitude: Between 800 and 1550 metres above sea level. Habitat and Ecology: The species grows in high altitude arid grasslands in patches of barren granite and scree above the tree line. 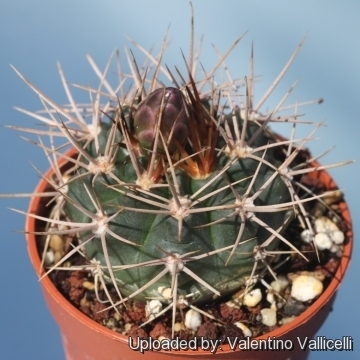 Illegal collection is depleting the only known population of Gymnocalycium neuhuberi, which has a very restricted range. 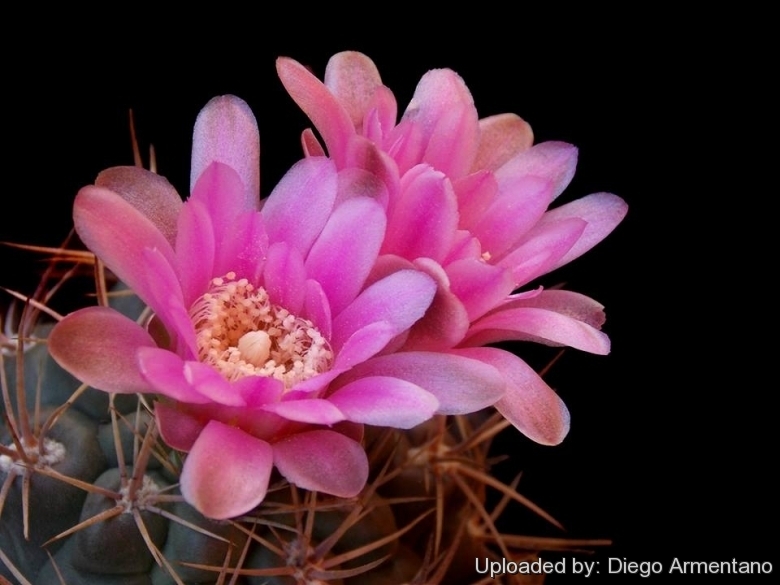 Description: Gymnocalycium neuhuberi is a beautiful species, of modest size, particularly attractive for its beautiful lilac flowers with a usually yellowish (sometimes orange or brown) spination. Not only the neuhuberi has a beautiful flower for a Gymno, but it is also scented. When it was discovered, probably because of the large pink colour of its flowers, this taxon was put in relation with Gymnocalycium monvillei. In fact it grows together with the local form of Gymnocalycium monvillei and a beautiful form of Gymnocalycium fischeri named Gymnocalycium fischeri ssp. suyuquense by Berger in 2003. Habit: Gymnocalycium neuhuberi is a slowly growing succulent species, usually solitary. Stem: Spherical or hemispherical, usually much depressed, gray-green, to 4,8 cm tall and 7 cm across. Epidermis dull, fine-grained. Ribs: 9-12, wavy, conspicuously divided into pentagonal tubercles with a small blunt chin, tubercles at the base of plants flattened and often wider than tall (15-20 mm wide). .
Areoles: Round to oval, about 6-7 mm in diameter, slightly depressed, 15-20 mm apart, naked or with some short woolly felt just on top of the areola. Spines: Aciculate, sharp, terete to slightly curved, the base thickened, yellowish, but occasionally orange or brownish. Central spine: Usually 1 in young specimens, later 4, forming a cross in adult plants a little longer than the radials. Radial spines: About 9, lower ones15-22 mm long., upper two pairs shorter, 11-12 mm long, the old plants often have 1-3 small bristly spines in the uppermost edge of the areola. Flowers: From young areoles near the apex, funnelform, pale violet or lilac, 27-36 mm long, 26-34 mm in diameter and sometimes even larger. Pericarpel short conical, 6-7 mm long, 9-10 mm in diameter, light green, shiny, with broadly rounded or slightly pointed, pale brownish scales, upper scales longer than the outer petals. Outer perianth segments linear-lanceolate, up to 21 mm long, 6 mm wide, with a mauve relatively wide, medium green stripe. Inner segments lanceolate, becoming gradually shorter toward the centre (20 mm long and 5 mm wide decreasing to 13 mm long and 4 mm broad) lilac with darker purple mid-stripe. Filaments thin, white, 5-6 mm long. Anthers circular, about 0.8 mm in diameter; pollen pale yellow. Pistil slender, white, 12-14 mm long, 1.5 mm in diameter. Stigma with 9 creamy white, slender, lobes 3-4 mm long exerted beyond the stamens. Nectar chamber 3.5 mm wide, 1-2 mm high. The cavity of the ovary is 5 x 5 mm, shaped like a urn, with white walls and densely filled with white ovules. Blooming season: Flowers are produced in late spring and remain open for up to twelve days. The flowers are diurnal and open in the afternoon. Fruits: Oval, dark green, 15-18 mm long, 10-12 mm in diameter with dried flowers remnants.. Seeds: Helmet shaped, 1,2 x 1 mm, black, testa with slightly raised cells. Hilum and micropylar area large, flat, nearly spherical. The seeds are covered with a thin dry skin, which can be easily detached. Gymnocalycium neuhuberi H.Till & W.Till: has pink flowers, yellowish, orange or brown spines. Distribution: Suyuque Nuevo and Suyuque Viejo, and southwest flank of the Sierra San Luis, Argentina. Gymnocalycium pseudoneuhuberi n.n., Šorma: has cream coloured spines and white flowers. Distribution: Suyuque Nuevo, San Luis, Argentina. 1) Demaio, P., Perea, M. & Trevisson, M. 2013. Gymnocalycium neuhuberi. In: IUCN 2013. "IUCN Red List of Threatened Species." Version 2013.2. <www.iucnredlist.org>. Downloaded on 04 January 2014. Cultivation and Propagation: Gymnocalycium neuhuberi is a summer grower species that is easy to cultivate. Frost Tolerance: Reputedly resistant to frost if kept on the dry side prior to, and during, cold weather, but for safe cultivation it is best to avoid severe freezing temperatures.